Jack Lalanne's Power Juicer Elite is fast and quick way of juicing your favourite fruits and vegetables. You can begin juicing straight away without preparing any of the fruits or vegetables and you can even just leave the skin. The Power Juicer Elite using its patented technology can extract upto 30% more than any juicer available on the market. The Power Juicer Elite boasts a quiet 250watts/3600 rpm motor and has a stainless steel blade. As well it easy to clean and is dishwasher safe. Jack Lalanne often called the "God Father of Fitness" is an American fitness, exercise and nutritional expert. He is best known for his success as a body builder. With your help we can reach more people and let them know about Jack LaLanne Juicer whether this product works or not. I got the juicer as a gift and I was elated! I've wanted it for so long! The juicer goes actually work, but not the way they show it on TV. It's much louder in real life and you don't get as much juice, but it really does work. It comes with a tool to get the blade out and a brush to clean the blade. It can go in your dishwasher, but I would recommend washing it by hand because it takes up a ton of room and if the pulp dries on the parts before you run the dishwasher you"ll have to scrub and scrub and scrub to get it off. Overall, I LOVE the juicer and would recommend it to anyone who wants healthy, natural juice and who has room to store the thing (it is rather large). 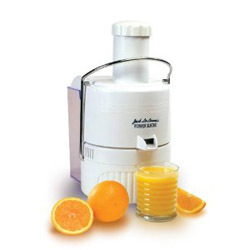 I am extremely skeptical when it comes to ordering ANYTHING "As Seen on TV" because none of it works as advertised, and most all of these products turn out to be cheap garbage which is extremely overpriced, but, the Jack LaLanne Juicer works great. It is everything Jack says it is. I love this juicer. If you want to start juicing, this juicer is most definitely the way to go. It is so easy to take apart for clean up, and is just as easy to put back together. It is awesome being able to use whole fruits and vegetables without chopping. Every now and then, you will find a large apple or something that is just a bit to big to fit in the shoot, but just one chop definitely beats having to peel, remove seeds, and completely dice. This juicer is truly what it is advertised to be.